Medium and large fish are then placed into a brine pit and soak up salty brine before being placed in the sun. The meat is not usually used for human consumption, although it is traded into the interiors of Baluchistan and Sindh Provinces. The smaller fish are dried in the sun in the desert scrub areas north of the village. 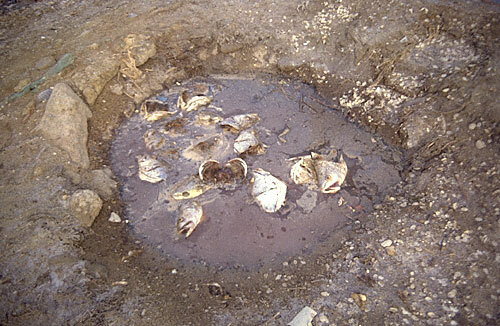 The fish are spread over the ground surface and allowed to dry in the sun. This creates an extremely odorous wind! These fish are used to make a fish meal that is fed to local poultry farms as well as processed and sold overseas. This fish meal is an extremely important part of the economy of Pakistan. During the month of October, the temperatures climbed to well about 25 and 30 degrees Celsius. I prayed for wind to cool my village hut in the evening, but at the same time I prayed for no wind, because it came from across the desert and brought an intense smell of rotting fish!